We arrived in South Africa all well and excited for our adventure here over the next couple of days and for some relaxation and recreation. We are staying at the Kwa Maritane Lodge and will be going through Pilanesberg Reserve to see some wildlife. 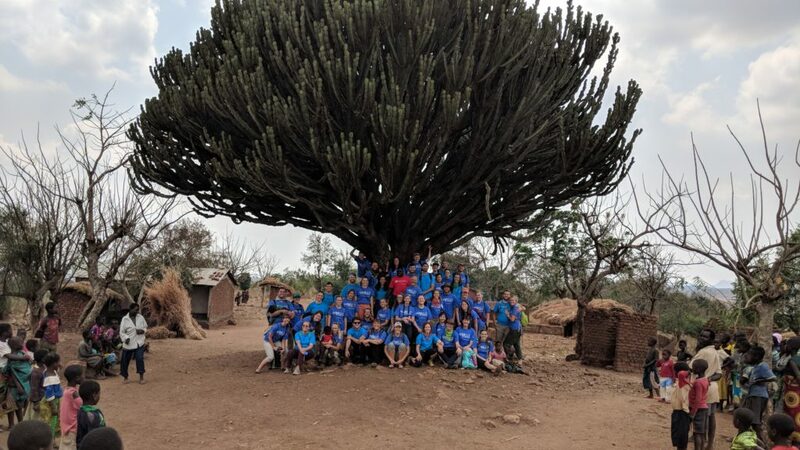 Monday and Tuesday: our two groups went to the clinic and worksite respectively and then met up together for our evening meetings and dinner together. Wednesday, we all gathered at the worksite and explored the transformation of the existing school and desks that were just frame. 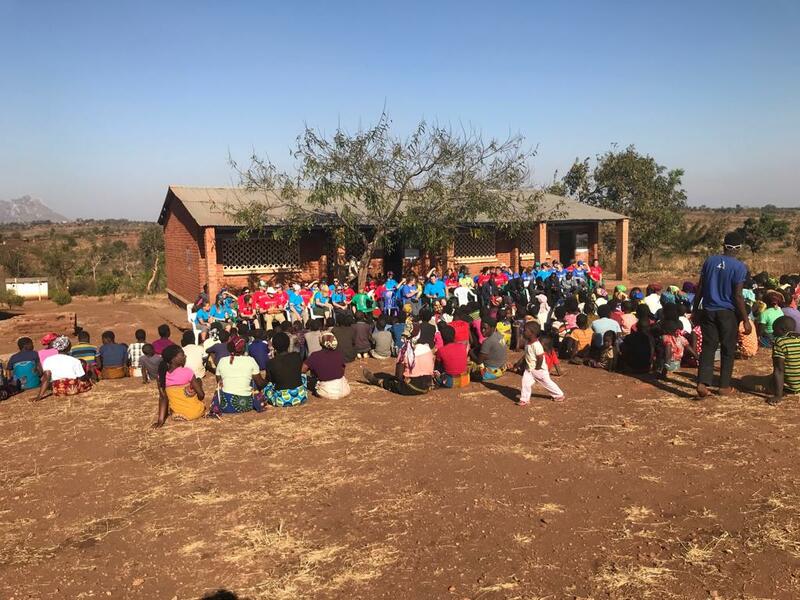 We worked alongside the local chiefs, leaders and children of Selengo to renovate the existing classrooms of the secondary school with new paint, beautiful painted alphabet and pictures, along with numbers on the wall and a map of Malawi in one of the rooms. They were painted with such wonderful teamwork, joy, laughter and care in doing our best work with all the utensils and tools provided. We cut wood to build and varnish the school desks for the children and they were such a welcome site for the teachers and children. The 3-room primary school block walls are complete and half of the iron windows and doors were installed. The library foundation was poured and a couple layers of brick had been finished there too. Everyone on our team and in the village was in awe at all that was accomplished in such a short time. We delivered more of our donations and then went down to the borehole to plant additional plants around the banana trees and start to pump water with the chiefs and elders of all the villages with the brand new pump giving life to this area. Eston then took us on a tour all around the village of Selengo and the children were being carried, riding on top of or holding hands with just about every member of the team at some point. Really precious moments going on while we looked at the humble circumstances where they lived. Their smiles were big and bright and though teeth were missing, brown or mis-colored… their hearts smiled through their eyes and it has been wonderful spending time with them. Truly, they emulate “The Warm Heart of Africa.” What stands out to me is when the headmaster told us previously that the schools had NO books… I spoke with him about how this worked and he explained that teachers would have the children spell in the dirt and that older children might help the younger ones. Their community is strong and loving. Following our village tour, we returned to the school and were greeted with many performers, such as drummers, various dancing and singing groups and some men in costumes (sorry – can’t remember what they are called). We had our last PBJ’s and said our goodbyes, leaving Eston there to further educate village leaders and members about permaculture and sustainability principles for planting and how to better care for the earth and manage the rain runoff for a more sustainable solution to grow their food. Thursday we travelled to South Africa and enjoyed a later dinner out in the bush. Saturday was our 3rd Annual Medical Conference (we have yet to name it, so it may be the “Rocky Mountain – Malawi Health Sciences Conference” (RMMHSC) in the future or something along those lines)! Five Clinical Officer students (equivalent to our Physician Assistant students) from the Malawi College of Health Sciences presented case studies that sometimes stumped us all and they ranged in topic from a chronic cough that did not resolve after several types of treatment, to a pregnant mother with pre-eclampsia. The MS Speech Pathology team presented a background about what Speech Pathology is and how they help people. They also taught the students about a speech valve that can be used for individuals with tracheostomy. The Physical Therapy (PT) students presented three different case studies about patients they had recently encountered, and those patients had issues that ranged from post-concussion syndrome, diabetic neuropathy, plus the effect of diabetes on feet, where one person had the big toe amputated and had to re-learn balance for walking. Finally, the Physician Assistant students presented case studies and taught the group about several topics such as sleep apnea, colon cancer, managing chronic pain, and management of dizziness. Once the presentations were over, our Rocky Mountain University group presented the Malawi college students with pounds of medical textbooks. There was much fun and fellowship and a lot of sharing of hugs, handshakes and treats. It is safe to say that our clinic team made life-long friends. Our worksite team started painting the alphabet letters on one of the walls in one of the 4 classrooms that we are repairing and repainting, while several of us went down to the borehole to plant banana plants in a large hole that the young men of the village had dug where the runoff of water will be, so they will have some income in future years from many trees. Other plants will be planted around that water source for the villagers to help in sustainability. Eston Mgala, our permaculture expert, will also work with the villagers to help them dig swales to steer the runoff of water during the rainy season to help with plants and food and not flood buildings and homes. Sunday, we returned to Eston’s Presbyterian church, Kafita, where the congregation, pastor and leaders warmly greeted us and invited us to participate again with talks and singing. Dr. Miriam Cortez-Cooper, Jessica Roberts and Stefan Lee shared beautiful words of wisdom and inspiration and we had many of our team members get together for a men’s singing group with Ben Roberts at the helm and sharing his voice talents with all. 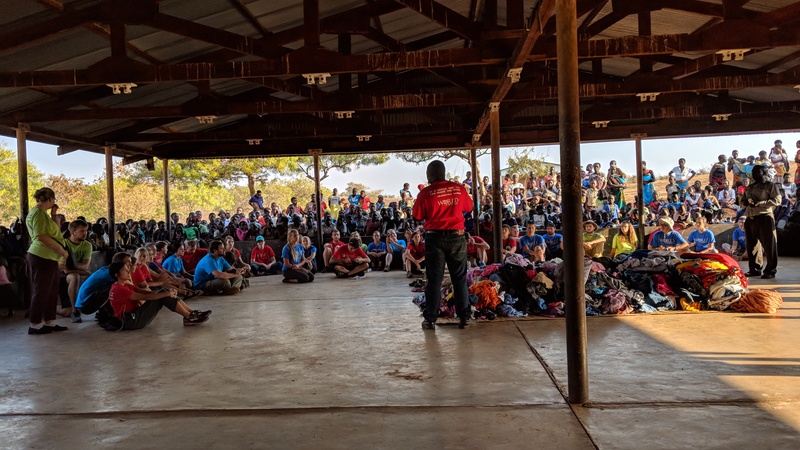 Many of our team members wore some of the fabric that the local women wear for skirts and we present Bibles and Malawian Hymn books in both English and Chichewa to the leadership groups. After church, we returned to Selengo to present the school with donationd many of the chiefs were on hand to greet us and receive them formally along with the headmaster of the school. We then walked just down the road to present a clothing, toys, sports equipment and books to Hope Ministries Orphanage (pictured is the mass pile of donations with the team). The entire village followed us and many were already awaiting our arrival, so perhaps 700-900 people total were present… maybe more with all the littles. Each team member worked individually with an orphan to help them select something they desired from the donations. One of the young high school-age boys that originally had a frisbee seemed to look longingly at the donation pile as if he’d wished to get an alternative, so I spoke with him and he said he’d like a book. As we walked toward the large array of books, I was hoping desperately that there was something for an older student that he might enjoy and I saw a couple of fatter books at the top. I picked up both for him and the first was a story about a girl, so I was very hopeful the larger, fatter, yet older book would be appropriate for him and he’d like it. I turned it over and it was a dictionary! I asked him if he would like a dictionary and he took it and held it so tight while he just lit up and was happy to have a dictionary! Finally, one of the street vendors was Samuel Banda and he paints with his mouth and feet, for he has no hands. He is warm, welcoming, and talented, for he was selling his paintings to make a living. This man didn’t give in to his circumstances, he decided not give up or give in, but to use his skill and purchase his own shoes, his own clothes and even a hat to humbly sell his artwork. I purchased a painting of zebras and encouraged others to meet him as well. He was an example to me of a very capable, articulate, warm and determined soul. A beautiful example of a human. Each day is filled to the rim with new experiences as we stretch ourselves to serve with all we’ve got here in Malawi. 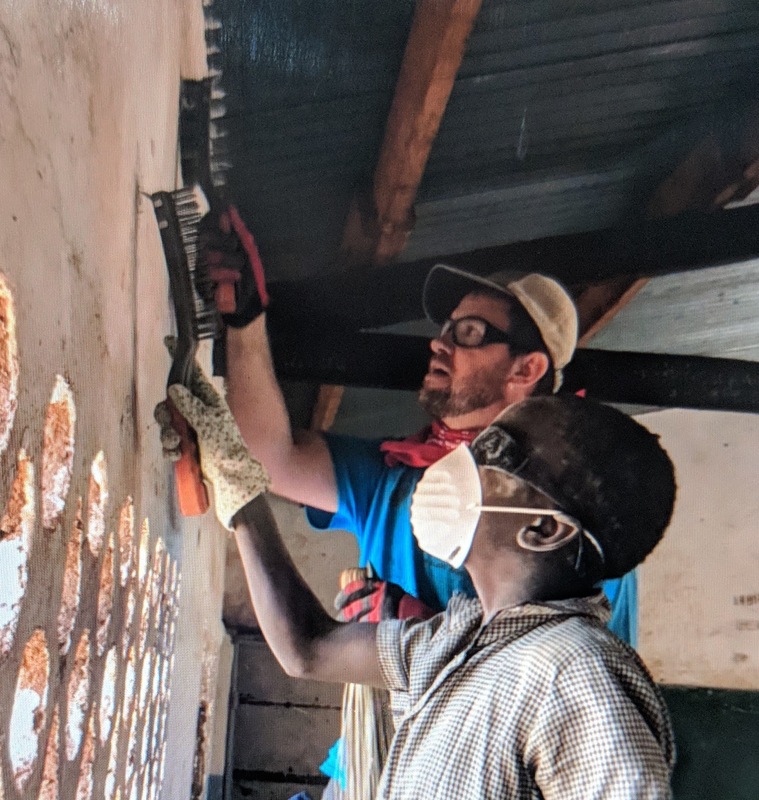 Tuesday was another day for the entire team on the worksite filled with school desk building/repairs, classroom repairs of the walls and chalkboards and also masonry work on the new 3-room school block. We’ve had some extraordinary leaders rise to the surface in various areas from our team in a myriad of extra volunteer roles from organizing our lunches, helping with our water supply, helping lead various work teams and providing motivational thoughts. Everyone is stepping in to help each other and the beautiful people we meet here along the way. 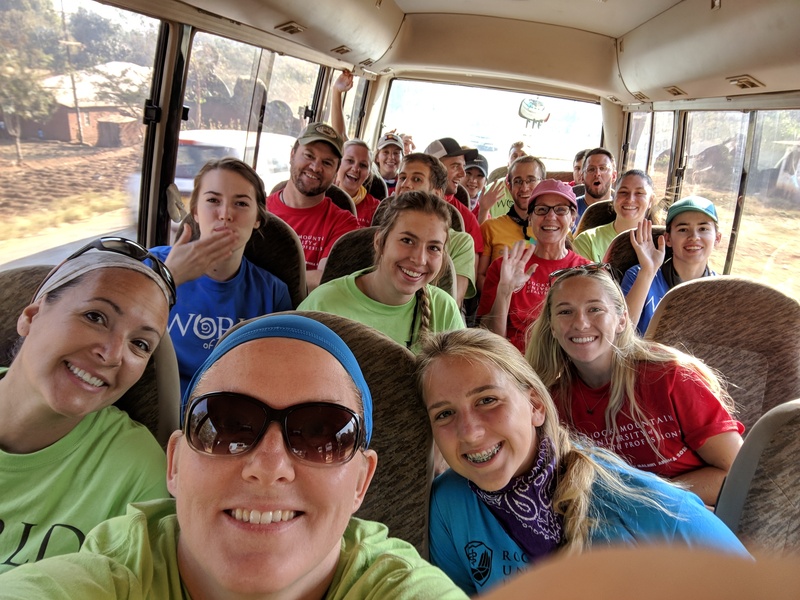 Wednesday was the first day that our clinical team (30 strong) went to their clinical areas and rotations at Kamuzu Central Hospital and Child Legacy International. They have had sobering and wonderful experiences these past couple of days and have seen many things that will transform their future as health care practitioners. In addition to meeting as a team nightly to share thoughts and reflecting mindfully on the experiences we are having, the clinicians also have the opportunity to circle up together as they have much to process. There have been many inspiring moments, as they deal with the reality of limited resources and incredible need. There is much personal growth and growing appreciation for the abundance, technology and opportunities we have back home. On the site we are astounded at the building progress made in such a short time. In no small way this is due to energetic young people with the passion and curiosity to work and learn alongside of the team as we work. We have held up these more gifted young folks and asked that they assemble teams of their peers to tackle specific jobs. They painted a classroom in the amount of time that might have taken us twice as long without them! We are delighted to be able to support this kind of learning in our target communities we are serving. When Eston, our permaculture expert, returns to do a 5-day training in sustainable agriculture, he will target these same kids to help him, a win-win situation for all involved. So, we are doing well, now more than halfway through our Malawi experience and so grateful you have shared this incredible team with us. Sunday, we attended and participated in church services joining Eston Mgala’s (our permaculture expert) congregation in Lilongwe. Several groups in the congregation took turns singing angelically. Tyler Sommer and Dr. Melanie Carlone were invited to be the guest preachers, and they spoke about charity and servant-leadership. Our team was asked to sing a song for them, so we sang a service-related hymn, “Have I Done Any Good in the World Today?” and we sang a working/serving song as we brought in donations for the charity associated with the church congregation. We repeated our song over and over and the entire congregation joined along. Cam did impress them with his piano playing as well. There were many other songs, prayers and messages and it was an honor to participate along with the members of the congregation. Many of the little ones found their way to the welcoming arms and laps of our team members during the service and gathered around outside afterwards to sing for us and send us off with more smiles and hugs. After church we had the most delicious PBJ’s or PBH’s (honey) you could imagine (they taste better when you’re hungry)… this meal will be a staple for our lunches during our stay here quite a bit. We visited a historic park, some climbed a tower and a very rare, friendly pet dog came and hung out for a bit (peanut butter lured him in). The awesome highlight of the day was our visit to a baby orphanage, where each team member played with kids five and under and even held the babies (one was just four days old). There were bubbles blown, balls tossed, wagons pushed, hands held, babies rocked, goofy voices heard, laugher felt and love oozing from each heart. It was such a joy to watch all the interactions of our 45-member team and all the littles just loving someone loving on them… truly touching. Of all the highlights watching and participating and holding the littles, I think the best part was at the very end, where a man, Roland, and his girlfriend from Texas (who ‘happened’ to be on our same flight in to Lilongwe on Friday!) – came to spend time with the kids and hand out pieces of chocolate. He said he lived there 24 years ago, later adopted a daughter who was an orphan and explained that this was ‘his family’ where he happily visited frequently to give back. I was touched about to tears… for this is what life is about and this aligns with our purpose and mission of service. Monday we made our way to the school worksite in Selengo where everyone divided off into teams, but in a really incredible way it was like a rotating teamwork all day long. From sanding the existing schoolroom walls (pictured is Stefan with Edna), to planing and sanding the desktops. We also carried hundreds of forty-pound cinderblocks to start building the walls with mortar working alongside our local construction team and volunteers from the village for the three-room school block. The children worked with us all day long: smiling, laughing, simply enjoying all of us being together. It was so special to be able to see this project start to literally come off the ground! The children, and even some of the adults, were treated to having their nails painted. Another exciting treat that created quite the lineup was having name tags made for them. Towards the end of the day one of our team members was cleaning her hands with a wet wipe and the kids were curious about that so they were then treated to having their necks cleaned off of all the dust from the workday and they loved having their necks wiped down! It was so humbling to see happiness on the children’s faces for the things we quite often take for granted. Once our work day came to an end, a dance circle formed where we took turns having the children enter the center of the circle to dance with one of our team members. The kids clapped and laughed along, what a wonderful way to end the day! This may be a new ritual to end each workday going forward. We can’t wait to get back tomorrow and experience a whole new day. Thank you again for sharing your families with us, they all miss you as well but just know that over here right now, they are making a world of difference! At the end of the day, we ended with a team meeting and time to reflect on the activities of the day, along with share some precious moments and learnings together. So may rich experiences and pictures, so I engaged the help of several people tonight to author this together. It’s been wonderful to watch the interactions, the service for each other and the unconditional love toward complete strangers as we serve alongside each other here in the Warm Heart of Africa. 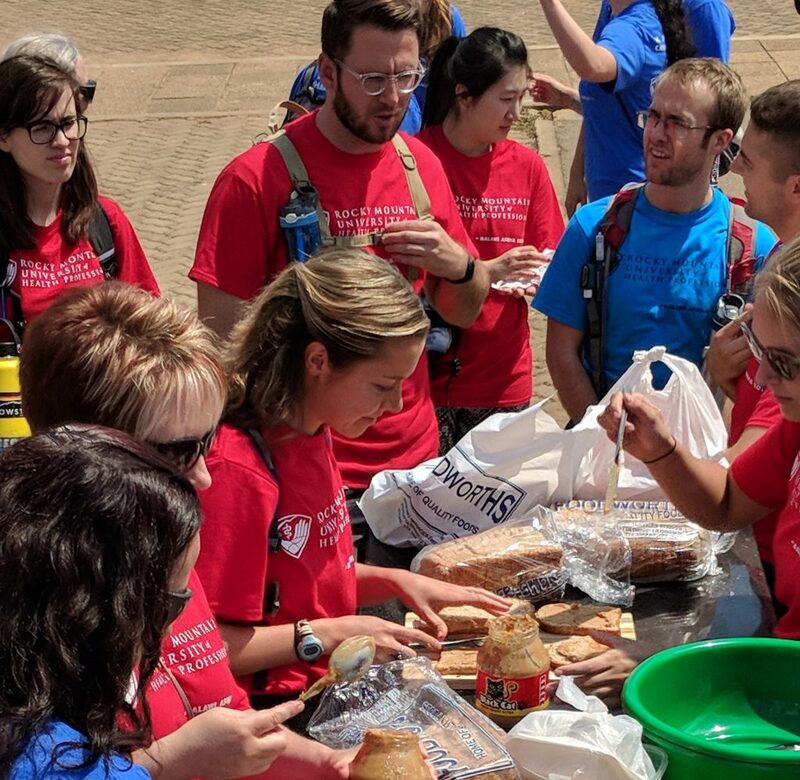 We arrived safely Friday here in Lilongwe with wonderful food on our flights and with happy, yet tired team members all around! We arrived just after noon and our process through the visa line was our quickest yet, though still a hand-written, hand-stickered, hand-stamped, and hand-checked process (yes – four people checked each of us in one by one by one). We are staying at a beautiful hotel in Lilongwe with a cook who is an expert in food from India and we will also have African food too. The hotel staff members are all lovely and accommodating and have been anticipating our arrival. Last night, we unpacked our 4,500 pounds of donations that we brought and divided it among many orphanages, hospital and medical facility/school as well as a nearby church congregation with a large orphanage program. It was touching to see all the wonderful donations that everyone collected, lugged, packed and unpacked to serve so many! Our 45 team members represent hundreds and hundreds of wonderful people who are all helping with our efforts and we are honored by your support. Today, we visited Child Legacy International (childlegacy.org) and then met the chiefs, top leaders and villagers of Selengo where we will build a 3-classroom school block, library and repair a teacher’s house. They gave us a very formal warm welcome with the leaders in their Sunday best and we toured the site, walked down to the well that we are having drilled for the community (called a borehole) and then had a lot of fun with about 150 kids. The headmaster for the school is grateful for our assistance and support and the villagers are excited to work alongside us. As part of our permaculture and sustainability focus, we work with the community to build a sustainable food source. We are very keen on finding sustainable ways of supporting the work of our Malawian partners as they struggle to restore health to themselves and their rather devastated environment. Over the next two weeks we will be dedicated to helping increase educational opportunities with our school building and also into the root cause of poverty with our support and training in permaculture awareness, a systems approach to individual and community health. Team members are jumping in, serving, helping, working, laughing and learning! Today we bring our hearts and tools to begin a major building process. We all send our love and appreciation to our family and supporters and are REALLY excited for our adventure!